This recipe for Slow Cooker Apple Cider Pot Roast is the thing you want to come home to on a chilly day! Perfect with a little spiced pumpkin on the side. It always seems to sneak up on me, this whole days getting shorter and colder thing, but as soon as it dawns on me that no, it is not okay to leave the house without socks, I start being extra grateful for warm and comforting recipes that cook up in the slow cooker. Take this slow cooker apple cider pot roast, for example. You drop it in the slow cooker in the morning, go battle the elements, come home that dinner having forgotten about the whole slow cooker thing, and as you walk in the door you slowly realize that yes, dinner is deliciously ready. And it is piping hot all kinds of good comfort food. It makes the no-more-socks thing not as hard to take.You’d think that having spent my entire life in the Northeast and a lot of it romping in the snow in Vermont that I would have gotten used to the whole concept of summer not lasting forever. 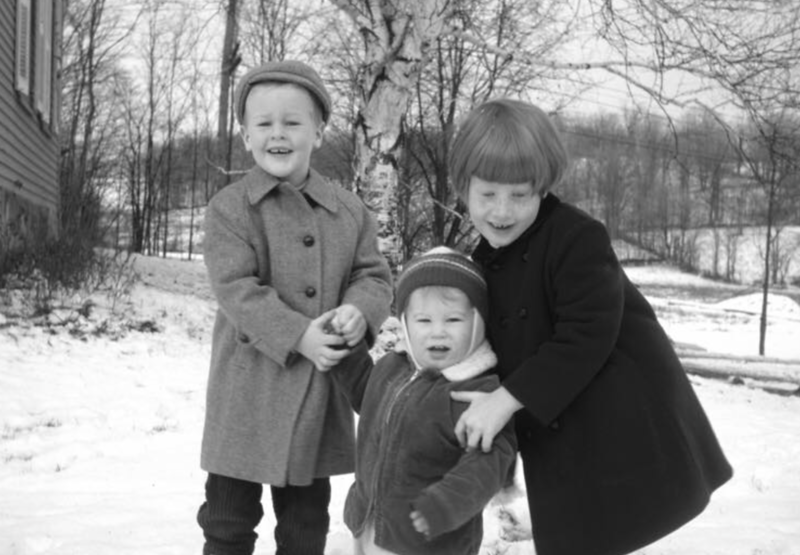 That urchin on the left is my brother, who has stayed up here in the Northeast with me. Maybe because he had a hat from the early days – the cold didn’t seem to bother him. And the cutie in the middle is my cousin Tom, who left for Clemson, South Carolina a while ago and stayed down there in the gorgeous Carolina weather. Although he does love Vermont with a serious love and comes back Vermont regularly…maybe because he had a hood AND a hat. Side note: WHERE ARE OUR MITTENS? This delectably tender pot roast cooks up in a bath of apple cider, beef broth and a serious amount of balsamic vinegar, all of which give it a perfect combo of apple sweetness and vinegar tang. I like to scoop it out of the slow cooker and carve it into slices, and then dunk the slices back into the juices in the slow cooker right before I put them on the plate, just to get even more of that great taste onto the plate. And speaking of the plate, last time I made this I served it up with pumpkin that I mixed up with butter and cinnamon. Yes, the kind in the can…but if you want to make your own pumpkin, click here for a recipe from my friend Ree. She has way more energy than I do, so I go for the canned kind, and it is still all kinds of wonderful with this beef. So find your mittens and dust off that slow cooker that I know you have...it’s pot roast season! Combine all remaining ingredients in a bowl or large measuring cup and stir. Pour over the roast. Use a spatula to remove the roast and slice. I like to dunk the slices back in the cooking liquid in the slow cooker right before putting on plates. Drizzle a teeny bit of balsamic vinegar on top of the slices and serve. Hi Kate I have been waiting for you to post this! So excited t make it. My question is: you don’t have to sear the meat first? Making a roast in the slow cooker is just about the best meal to me, Kate! I love your creativity with the apple cider. Sounds like it gives it so much flavor! This definitely sounds like a delicious meal for the cold and rainy weather that’s coming my way this week! This flavor combo is incredible! I have got to make this soon! Comfort food at it’s best! Sounds yummy! I have a roast in the fridge just waiting to be cooked. I don’t have apple cider but I do have apple cider vinegar. If I used balsamic vinegar too do you think that would be too much vinegar? I do think that would be too much vinegar – you need the sweetness of the cider to balance the sharpness of the balsamic vinegar! But, if you add another cup of beef broth along with 1/2 cup brown sugar in place of the cider, you will get the same basic effect – give it a try! Thank you! I’ll definitely try it! I need slow cooker recipes!! This is perfect, thanks for sharing! You guys were so cute, but seriously. Where are your dang mittens? That ain’t cool. This looks like the coziest, warmest winter dinner. I want that any night, romp in the snow optional! My romp in the snow days are definitely over – but my pot roast slow cooker days will go on indefinitely! Made this today and it was delicious!! This is a keeper. Thank you! Hi Anne! 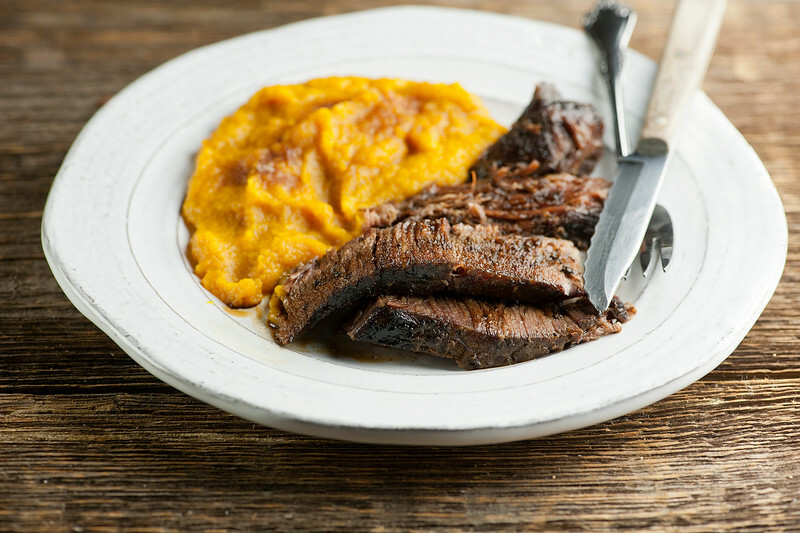 I’m so glad – I’ve decided it is my new favorite way to make pot roast! Hey Brad! Yes, you definitely can. The potatoes should be just fine…I sometimes cook the baby carrots separately on the stove and stir them in at the end just so they don’t get too mushy. Happy cooking!